The 2019 Tour De Donut is going to be another great event! Now in its 31st year, we have had between 1200 - 1,500 riders! Through your racing, fun and generosity, we donated between $15,000 - $20,000 to bicycle-related charities and the local area. We also awarded more winners of the Roger Kramer Memorial Scholarship fund, remembering our friend and one of the founders of the Tour De Donut. For that, I will be always grateful. Check out TDD News for Blog Updates! Safety is always a big concern. We need to stay vigilant. The local ambulance services provide wonderful support. Fleet Feet will implement RFID timing again this year. We will have to manually enter the donut counts, but this will clear up the logjam at the finish! Also, we are asking the recreational riders to let the speedsters start in front this year. Riding at 20-25mph on someone's wheel can be a hair-raising experience, especially if you have no idea if the people in front or around you know what to do -- how to hold a line, signal slowing, point out road hazards, etc. 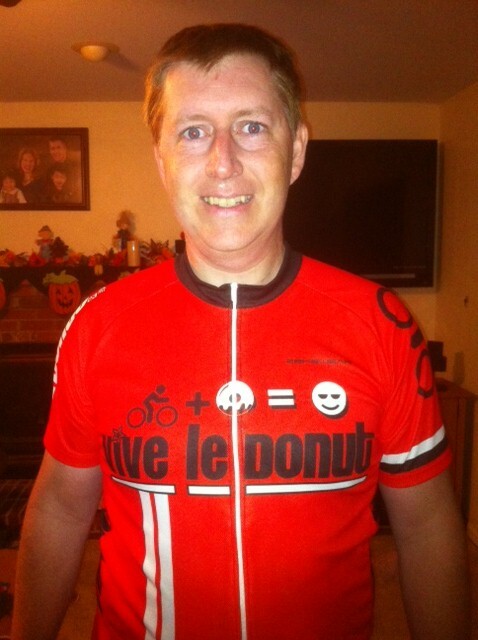 This request is necessary because the Tour De Donut has grown in popularity and because we need to reduce the risk of injury in the first mile or two. I have been collecting a lot of lessons learned and suggestions from previous years, and I welcome your comments. Feel free to drop me a note to tell me your favorite Tour De Donut story. You are a member of an exclusive bicycling family! Welcome! Please e-mail the race director if you want to contact me.